Evidence is provided for an association between CMV reactivation and poor OS of patients with head and neck cancer in the setting of high systemic inflammation. 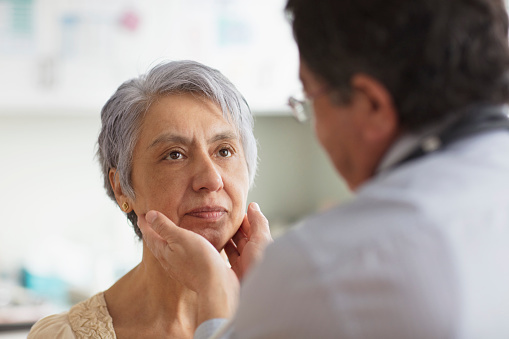 Results from a study of nonsmoking patients with head and neck cancer showed that reactivation of the cytomegalovirus (CMV) in the setting of high systemic inflammation was associated with poor survival. The findings from this study were presented at the American Association for Cancer Research (AACR) Annual Meeting 2019. CMV is a herpesvirus (human herpesvirus 5) More than half of adults by age 40 have been infected with CMV, and the virus can remain latent in CD34+ cells. Although there is emerging evidence to suggest that CMV infection may play a role in the development of some solid tumors, possibly through preferential differentiation of CMV-infected cells into immunosuppressive monocytes, this potential association had not previously been investigated in the setting of head and neck cancers. In this study, a biomarker of CMV reactivation (ie, circulating levels of CMV DNA) and a biomarker of systemic inflammation (ie, levels of C-reactive protein [CRP]) were assessed in relation to survival across a cohort of 184 nonsmoking patients with head and neck cancer. The findings from this study showed that levels of circulating CMV DNA on their own were not associated with patient survival (hazard ratio [HR], 1.5; 95% CI, 0.7–3.0). Similarly, circulating levels of CMV DNA were not associated with patient survival in the subgroup of patients with low CRP levels (HR, 0.90; 95% CI, 0.30–2.71). However, patient survival was significantly shorter in the subgroup of patients with both high circulating CMV DNA and high levels of CRP compared with those without these biomarkers (HR, 8.86; 95% CI, 3.63–21.64). “Future work should address the generalizability of this finding to other cancer types and determine whether CMV-infected myeloid cells are present in the tumor,” the researchers concluded. Nelson HH, Miller JS, Hunter-Schlichting D, et al. Cytomegalovirus (CMV) reactivation and patient survival in head and neck cancer. Presented at: American Association for Cancer Research (AACR) Annual Meeting 2019; March 29-April 3, 2019; Atlanta, GA. Abstract 614/28.